Psicotaxi takes both friends and strangers for an imaginary ride. 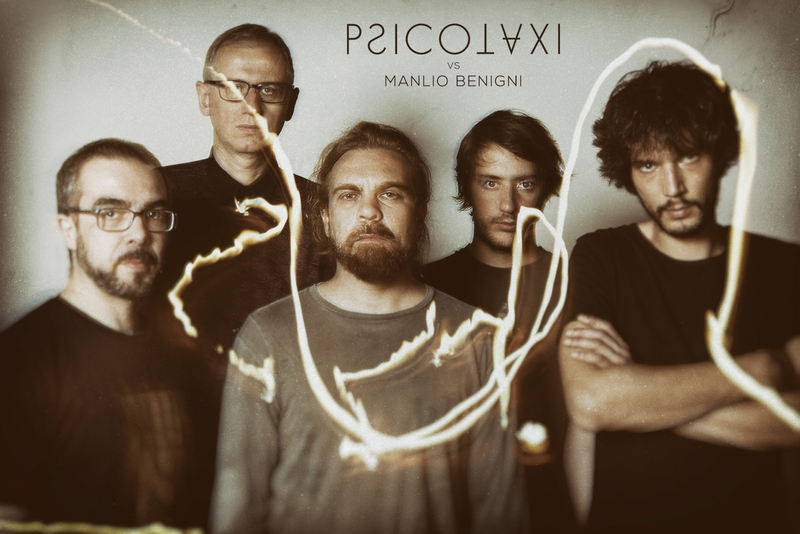 Psicotaxi formed in 2010 when four talented guys – Andrea Bordoni, Luca Bresciani, Lamberto Carboni, and Virgile Mermoud – made up their mind to record and issue a 3-track instrumental EP ( also available for download ). Besides being the band’s name, Psicotaxi is also the title of these musicians’ first release, a musical journey intriguingly blending progressive, psychedelia, and hard rock together. People get aboard, let their imagination run free, and get off, always leaving something in return for all the lifts they are given. In the following months, Psicotaxi started performing in Milan’s live music venues like Lo-Fi, Cox18, Trok!, Leoncavallo, Malabrocca, and Ohibò; also performing as the opening act to internationally famous stoner rock, noise and psychedelic music bands like, among others, Baby Woodrose, Electric Moon, Morkobot, Giobia, Bologna Violenta, and Confusional Quartet. Shortly after meeting writer and journalist Manlio Benigni in late 2012, the Milan-based band and he participated in some local, important Music and Literature Festivals, among which the Fuori Orario Festival held at Utopia Bookshop in 2013, the Slam X Festival at Conchetta/Cox 18 Social Center in 2014, not to mention the Record Store Day at Psycho, a well-known Milan’s record shop specialized in independent music, in 2015. Amplified, psychedelic music echoes, obsessive riffs; electronic, and a vehemently hilarious, subversive, pulp collective imagination. In 2015, record label Subsphera released Psicotaxi first album titled Effect of the Head’s Mass, a record consisting of 3 instrumental tracks and 3 other songs joined by Manlio Benigni. The album, also seeing the important participation of saxophonist Giampiero Risico and percussionist Emanuele “Manolo” Cedrone, proves the band’s predilection for space rock as well as a strong, visionary approach towards music that groups like Hawkwind, Can, Tool, and Ozric Tentacles have. In addition, this release definitely reflects these musicians’ sensitivity: alongside complex, instrumental , galloping rhythms and forward-thinking, visionary tempos are Manlio Benigni’s brilliant narrative skills, according to the Heavy Mental Poetry Project. This innovative poetry research absolutely showcases a new, original blending of music and words. Words meaning to be as hard as a rock, as sharp as a blade, and as graceful as a butterfly.